Primates can be observed in Sri Lanka, easily throughout the year. Toque monkeys are seen in large troops at archaeological sites such as Sigiriya and Polonnaryuwa. Sri Lanka is probably the best place in the world to see Blue Whales. It is almost certainly the best place in the world to see both Blue Whales and Sperm Whales together. This was realized and publicized only as recently as May 2008 by the author. The reason why it had remained unknown for so long was because since the 1980s, the attention of whale watchers had been focused around Trincomalee to the North-east of the island. The realization that Sri Lanka is a hot spot for Blue and Sperm Whales draws heavily on the work of Dr. Charles Anderson, a British marine biologist, resident the Maldives, who had been studying the strandings of cetaceans in the Maldives. He developed a theory that there was a migration of whales between the Bay of Bengal and the Arabian Sea which took them near the shores of Sri Lanka. He believed that the whales, especially Blue Whales and Sperm Whales, would be travelling past the South coast in December-January from the Arabian Sea to the Bay of Bengal. 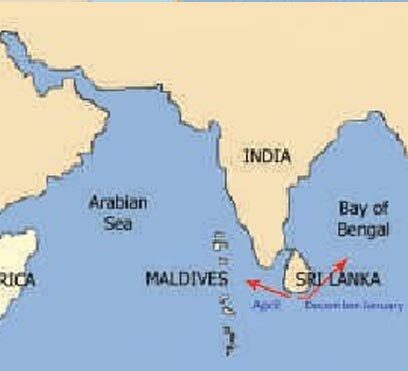 In April, they would pass the South coast on the return journey travelling West to the Arabian Sea, passing Sri Lanka and the Maldives. He had first suggested this theory in a paper published in 1999 which reviewed strandings in the Maldives. 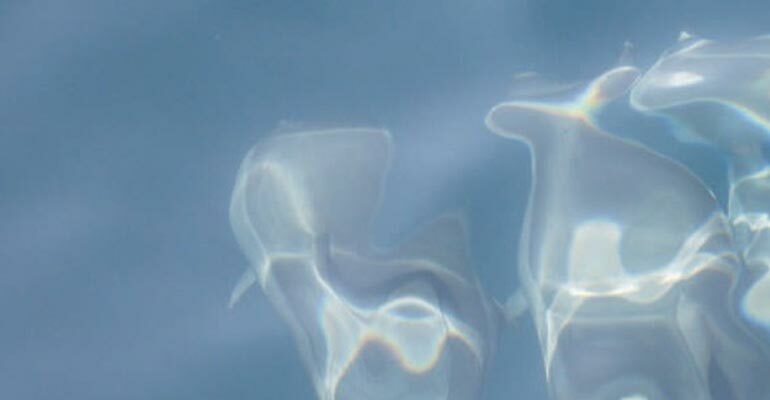 Having reviewed his records up to mid 2002, which were over two thousand sightings, he refined his hypothesis further in a paper published in 2005 in the "Journal of Cetacean Research and Management”. Although Charles had discussed testing this theory with the author in 2003, the first evidence of it came from Mirissa Water Sports. The latter was a project whereby a boat for maritime leisure had been given to a cooperative of twelve Tsunami affected youth. Simon Scarff and Sue Evans were voluntarily training the youth in running a business by helping with their English, marketing and sailing skills. 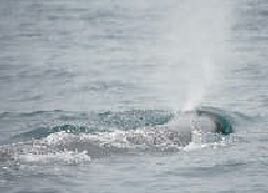 They came across whales in April 2006, which were reported in the Sri Lanka Wildlife eNewsletter. During April 2008, naturalist Anoma Algaiyawadu was on 22 whale watching trips during the first 26 days of April. He had a hundred per cent strike rate in seeing Blue Whales. In developing whale watching with Charles Anderson and Mirissa Water Sports, the author saw and photographed whales on every trip, during the season. On one trip, the author had Blue Whales, Sperm Whales and a pod of Spinner Dolphins, all in the field of view at the same time. 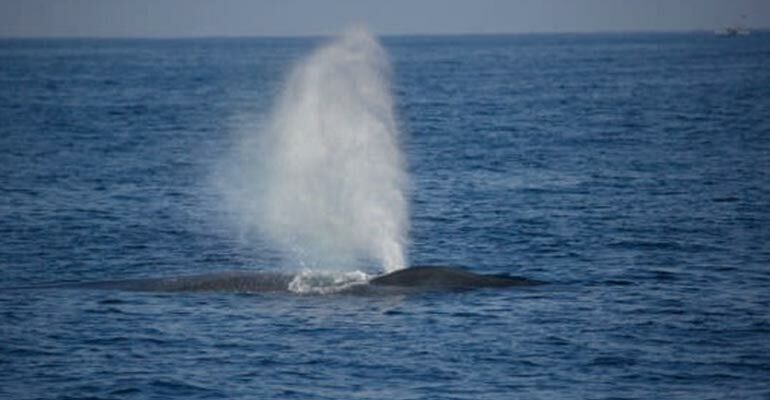 On another whale watching trip, the author and several others observed no less than eight Blue Whales spouting simultaneously, and estimated that ten or more Blue Whales were present within view of the boat. This is an incredible density for a marine mammal which is generally difficult to see. It has taken a surprisingly long time for it to be discovered and made public that the seas South of Sri Lanka are a whale watching hot spot. But starting from the first wave of publicity in May 2008, both the knowledge and whale watching infrastructure (including responsible whale watching) is expected to accelerate rapidly. The best time for the Southern (and Western) seas is between November and April, when they are relatively calm (and outside of the south-west monsoon during which the seas are too rough for going out). In calm seas the 'blows' or 'spouts' of marine mammals and the splashing of dolphins can be seen at a much greater distance than when the seas are choppy. Are there peak months when sightings are at their best? There are peaks in the movement of whales in December-January and again in April. In December- January the whales are passing the South of Sri Lanka, eastward to the Bay of Bengal. In April, the whales are travelling westward, past the South of Sri Lanka, across the Maldives and on to upwellings off Somalia in Africa. Where should I go whale watching in Sri Lanka? The seas South of Dondra Head are the best for whale and dolphin watching in Sri Lanka. 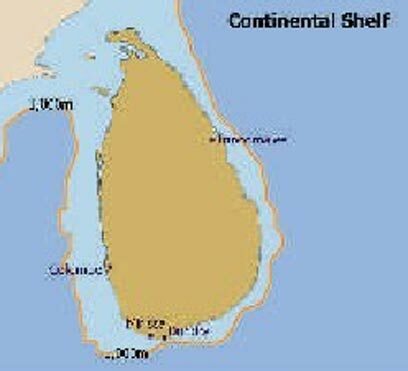 This is because the continental shelf is narrowest around Sri Lanka to the South of Dondra Head (the southernmost point in Sri Lanka). Depths of one kilometre and deeper are found relatively close to the South of Dondra Head, approximately six kilometres or 40 minutes away. 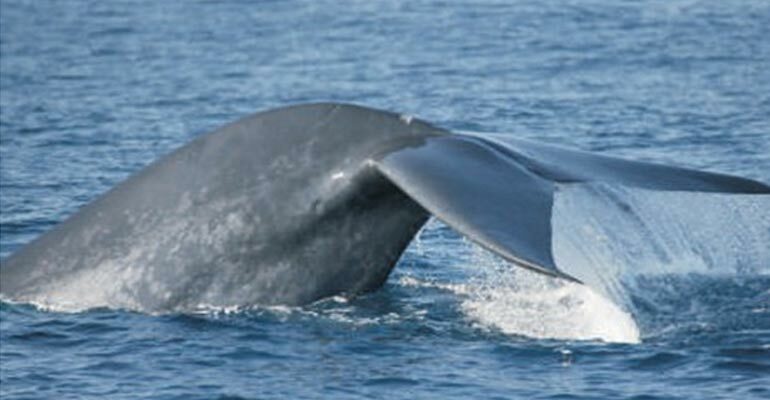 This may be the reason why both Blue Whales and Sperm Whales can be seen within sight of shore. Sperm Whales dive typically to a depth of one kilometre or more to feed on animals such as squid which live in submarine canyons. As deep water is found close to Dondra Head, it is more likely that Sperm Whales will stray close to shore. Blue Whales feed on krill found within the first 30 meters of depth. But will use deeper water when travelling. The depths and availability of food to the South of Dondra Head seem to create conditions favourable for seeing both species close to shore. Elsewhere in Sri Lanka the continental shelf is wider and therefore whale watchers may have to travel five or six times that distance to reach the one kilometre depth contour. The continental shelf is defined as the depth contour of 200m. The location of the continental shelf is important as the depth of water rapidly reaches a depth of one and then two kilometres or deeper beyond this. What am I likely to see? During the season, Blue Whales are a strong possibility. So too are pods of Spinner Dolphins. Sperm Whales are seen regularly. As mentioned before the author and naturalist Anoma Alagiyawadu had a one hundred percent strike rate in April 2008, for Blue Whales. However, as whale watching is in its early years, quantitative data are still too thin to confidently predict the strike rate for the entire window of time between December to mid April. 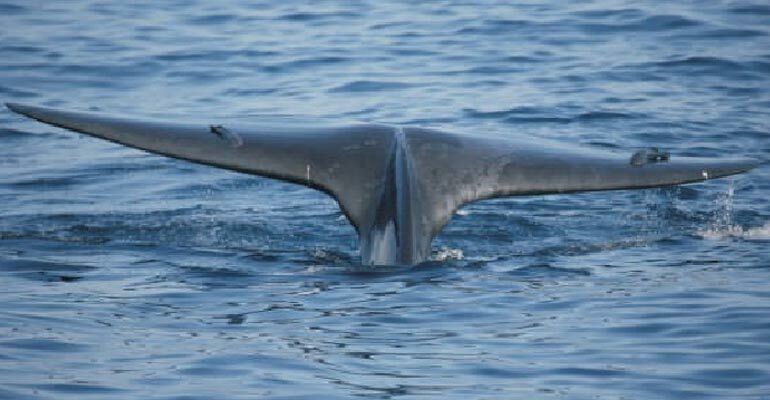 But early indications are that between December and April there is a strong likelihood of encountering Blue Whales during the entire whale watching window. Most whale watchers set off from the Mirissa Fishery Harbour. The coastal strip from Hikkaduwa, through Galle, Koggala to Mirissa has a broad range of accommodation including some of the most luxurious villas and boutique hotels in the island. This entire strip is within commuting distance from the Fishery Harbour at Mirrissa. Galle is approximately a 40 minute drive. The Blue Whale is the largest animal to have ever lived on the planet. It can attain a length of 30 m and weigh up to 100 tonnes. Whales are of two types, baleen whales which sieve water through their baleen plates and toothed whales which hunt larger oceanic animals. Blue Whales are baleen whales, they can sieve between 40-60 tonnes of water through their baleen plates when taking a single 'mouthful' which has been described as the largest bio-mechanical action in the world. The water is sieved through and the krill is retained in the baleen plates from which they are removed by the tongue. Krill are small crustaceans which are found in seasonal mating swarms. During the feeding season, Blue Whales of the Northern and Antarctic populations put on a lot of weight. They may have to fast for eight months of the year as the vast swarms of krill are seasonal. The smaller Blue Whales in tropical waters may have a reasonably reliable source of food through much of the year and any period of fasting will be much less. The Sperm Whale is a 'toothed whale' and has teeth on its lower jaw. It feeds on fish and other animals such as squid which inhabit deep water. Sperm Whales are the deepest diving whales going to depths of two kilometres or more. It can also hold its breath for over an hour. The front of its head (the melon) is filled with hollow tubes which contains an oil known as 'spermaceti'. They were hunted for the 'spermaceti' which was used as a lubricant. Early whalers mistook this for sperm giving the whale the name of Sperm Whale. The Sperm Whale's blow is small and bushy relative to that of the Blue Whale. 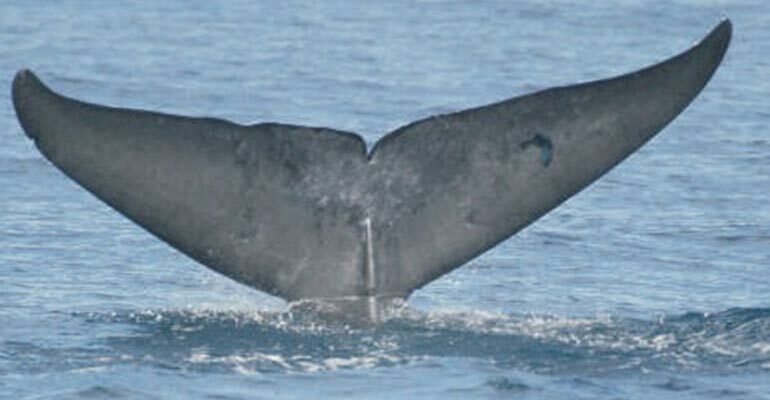 The blow hole of the Sperm Whale is slanted at a forward facing angle and to the left of its body. This produces a characteristically angled and forward directed blow. But at a distance the slanting of the blow is not always apparent. 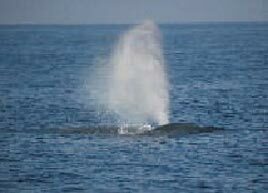 However the blow of a Blue Whale always rises as a tall column and its height is more easily observed at a distance. 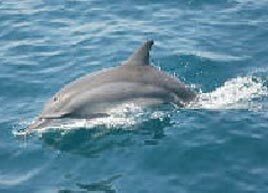 This is the commonest of the species of dolphins found in Sri Lankan waters. It is also the most spectacular, due to its engaging acrobatic leaps out of water. Whilst airborne it rotates along its longitudinal axis, hence the name 'Spinner Dolphin'. Some individuals have been counted performing eight complete rotations before falling back into the water. The leaps out of water are probably a demonstration of their 'fitness' to prospective mates and challengers. As to why it also spins is a matter of conjecture. Spinner Dolphins first entered the public consciousness in Sri Lanka in the first quarter of 2008 when the availability of accommodation and boats saw a large number of Sri Lankans engaging in dolphin watching off Kalpitiya. At times, approximately two thousand spinners have been in the field of view. In parallel, the development of whale watching off Mirissa also saw the public coming into contact with Spinners of the Southern seas. The seas South of Sri Lanka may be the best place in the world for seeing the elusive Blue Whale. For seeing both Blue Whales and Sperm Whales together, it is almost certainly the best in the world. In December-January and April, the numbers of whales peak as they engage in a migration between the Bay of Bengal and upwellings off Somalia in the Arabian Sea. DAY 01 Arrival and transfer to the south (the strip from Hikkaduwa-Galle-Mirissa to Tangalle) for five nights. DAY 02, 03 Mirissa for marine safaris. Blue Whales in concentrations not seen elsewhere in the world would be the highlight. Whales are seen relatively close to shore as the continental shelf is narrow to the South of Dondra Head. A bonus is the presence of Sperm Whales and pods of dolphins. Some whale watchers have seen Blue Whales, Sperm Whales and Spinner Dolphins, simultaneously in their field of view. DAY 04 Visit the Galle Dutch Fort (a UNESCO World Heritage Site). Take a nature walk at Hiyare Forest Reserve, near Galle. DAY 05 Marine safaris for whales and dolphins. Some pods contain more than five hundred dolphins, including the Spinner Dolphin, which engages in spectacular leaps. DAY 06 Another day out in the sea for marine mammal and sea bird watching. Some of the seabirds include skuas, shearwaters, terns and tropicbirds. Whale watching is seasonal, between December and April when the seas are calm.